Over the past few years, there has been a significant rise in the number of male patients seeking aesthetic cosmetic treatments to improve their physique and feel more confident in everyday life. Whether it’s an extensive surgical procedure or a less-invasive treatment such as tissue fillers or laser hair removal, there are many safe and effective solutions to help men make a positive change in their appearance. 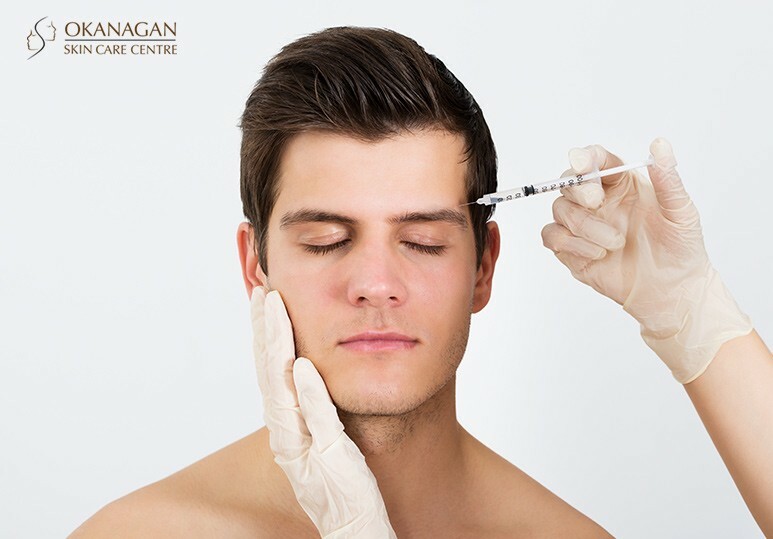 At our Kelowna skin clinic, we offer a wide range of customized non-surgical cosmetic treatments for men to create better and more natural-looking results than ever before. Plastic surgery is not a decision that should be taken lightly. While for some patients, it may be the best way to achieve their desired results, for others, non-surgical options such as Botox and tissue fillers, may be more suitable. This is also good news for men seeking to improve their appearance without going under the knife. During an in-depth consultation at our Kelowna skin clinic, we can assess your aesthetic goals and help determine whether a surgical or non-surgical treatment will best meet your unique skin requirements. Whatever aging concerns you may have, there are many different non-surgical treatments available to help rejuvenate the appearance of our male patients. As our skin ages, it begins to lose the collagen that helps shape and support it. Natural lines and wrinkles deepen and the face can also lose volume, giving sunken cheeks and a more tired appearance. The range of premium tissue fillers at our skin clinic - including Juvederm and Restylane - can address all of these problems without the need for extensive surgery. Tissue fillers can plump up your skin, smooth wrinkles and fill out any deep lines by replacing the collagen lost due to the natural ageing process. This gives a smoother, firmer and more youthful appearance. How it’s administered: The tissue filler is injected in small, controlled doses just under the surface of the skin and directly into the treatment area. How long does one tissue filler treatment take? Depending on the size and location of the treatment area, one tissue filler treatment can take 30-60 minutes. How long do the results last? Depending on which tissue filler you opt for, the results can last anywhere from 6-24 months. Laser hair removal for men has become a highly popular treatment to permanently get rid of any unwanted hair and offers an easier, cleaner and more effective solution than more traditional methods such as shaving or waxing. At our Kelowna skin clinic, we use the advanced GentleLase laser hair removal system to ensure that all of our male patients can enjoy the long-lasting benefits of smooth skin. The GentleLase Laser Hair Removal system works by directing a high-intensity light beam through the treatment area. This therapeutic heat eliminates the hair follicle’s ability to grow hair, leading to permanent hair loss and smoother skin. How it’s administered: A small hand piece will be placed on your skin, activating the laser which sends gentle and powerful pulses of light through the surface of your skin, permanently damaging the hair follicle. How long does one GentleLase treatment take? The laser hair removal treatment time varies from patient to patient depending on skin type, coarseness of hair and size of treatment area. How long do the results last? You can enjoy the results of our laser hair removal system almost immediately. The treatment area will remain virtually hair-free between your appointments. We recommend 4-8 treatments for optimum results. Microdermabrasion is a quick, effective and safe non-surgical cosmetic treatment that makes men’s skin look healthier and younger almost instantly. At our Kelowna skin clinic, we use the advanced DiamondTome microdermabrasion system that doesn’t add harsh, foreign particles to the skin, providing a quick and relaxing treatment similar to a facial. Diamond microdermabrasion is a gentle, non-invasive skin exfoliation therapy which leads to a more vibrant, supple and fresh appearance. It is suitable for men and women and for patients of all skin types. How it’s administered: Using a hand piece called the DiamondTome, our skin specialist will remove the old and damaged top layer of your skin to reveal the newer, younger-looking and healthier skin underneath. How long does one treatment take? Depending on the size and location of the treatment area, one microdermabrasion treatment can take up to 30 minutes. How long do the results last? Our male patients are able to see visible results after just one microdermabrasion treatment. However, a series of 4-10 sessions is recommended for optimum results. To learn more about the non-surgical cosmetic treatments for men at our Kelowna skin clinic, contact our specialists today at 250-868-9290.